This vegetarian recipe sees the traditional Brazilian dish of Risoles de Palmito baked rather than deep fried to produce a healthier meal which is jam-packed with flavour. The dish we chose to make for our Brazilian themed meal is Risoles de Palmito. The original recipe translated this as Hearts of Palm Croquettes, but to be honest, to Mr E & I these are more of a pasty rather than a croquette which is why I’ve called them Brazilian Heart of Palm Pasties. 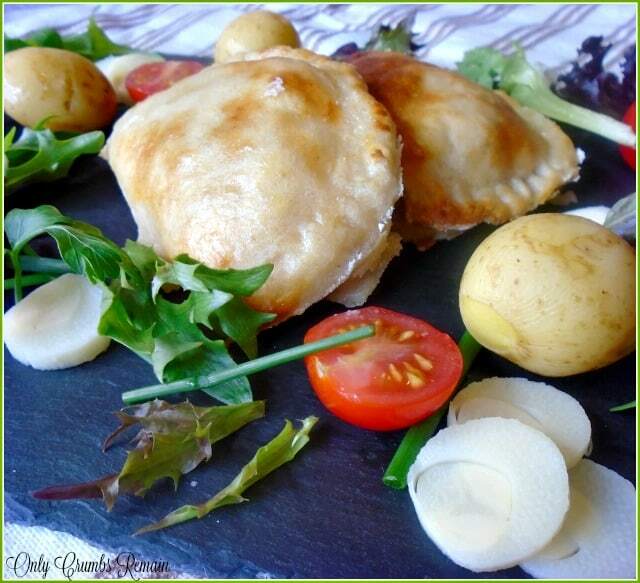 The pasties contain a scrumptious vegetarian filling which not only contains heart of palm but also carrots, tomato, and cream cheese. The dough is easy to make, and although the method resembles a hot water crust pastry the result is far more delicate than rigid. The original recipe sees the shaped pasties coated in breadcrumbs before they’re deep fat fried. 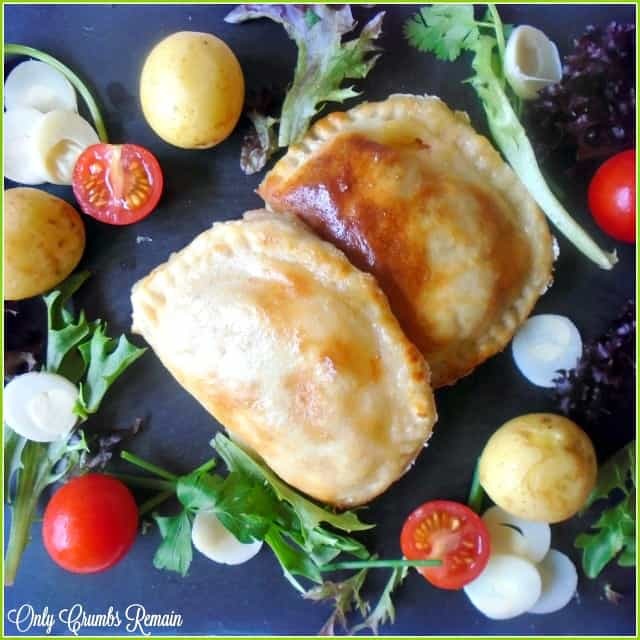 As deep frying isn’t a method of cooking I usually carry out and because our usual stock pile of breadcrumbs had been used and not replaced, we decided to oven bake these delicious Brazilian vegetarian pasties. I suspect the traditional egg and breadcrumb coating provides some extra strength to the delicate dough, but our oven baked method resulted in a healthier meal which was easy to pull together. There was no stressing about the fat temperature or any need to keep a vigilant eye on them whilst they cooked. These pasties really were absolutely delicious. In fact I had intended to photograph them part eaten, but the flavour captivated me so much that before I realised where I was they had been completely devoured! The filling was packed with flavour and was easy to pull together. We served them simply with new potatoes and salad. Hearts of palm is a vegetable which I often see during our routine shopping trips whilst down the canned vegetable aisle, but until now we have never tried them. You can buy Green Giant Heart of Palm in most supermarkets, canned and ready to eat. Now, I must admit that at around £2.30 per tin they’re not a cheap buy (sshhhh, Mr E doesn’t know how much they cost!) and that price was explained when I came to read about this unusual vegetable. If you’re unfamiliar with hearts of palm, as we were, they are white, cylindrical and each piece measures around 10cm long. To me they look a little like the white section of a leek, though much softer and narrower. 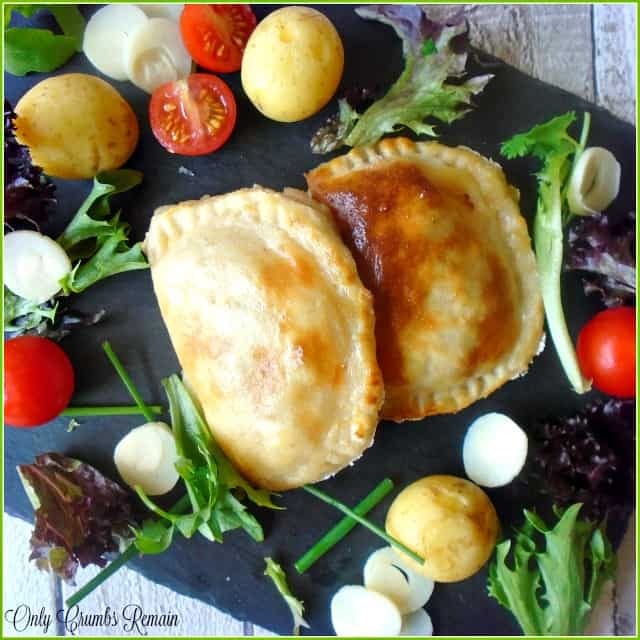 They are often used in salads, but can also be deep fried, used in soups or filling such as with these Brazilian Hearts of Palm Pasties. As regards to the flavour, it really is quite unique. Some describe it being like artichoke whilst others compare it to water chestnut. However you describe it, they really are very delicious. Like many foods, hearts of palm can often be referred to by a number of names, such as palmito, palm cabbage, swamp cabbage but the one which made me chuckle and will no doubt be a question in a pub quiz one day, burglars thigh! Wikipedia explains that hearts of palm are a vegetable which is harvested from the inner core of certain types of palm trees. In order to reach the vegetable, often regarded as a delicacy, the palm tree is cut which clearly results in the death of single stemmed trees! Clearly a controversial and sensitive subject. However Wikipedia goes on to explain that a particular palm tree has been cultivated for the canned hearts of palm. As it is multi stemmed the plant can be harvested for many years without resulting in its death. In doing my on-line reading about hearts of palm, I came across this You Tube video which shows the stages the plant goes through before it is harvested and prepared for canning. It highlights how much of a delicacy hearts of palm are which explains the relatively high price for just one can. which is jam-packed with flavour. Lovely served with salad and new potatoes. 1. Make the pastry dough. Place the water, butter, oxo and olive oil into a good sized pan. Set over a medium heat on the hob and allow the butter to melt. Bring the liquid to the boil. Tip the flour into the pan and use a wooden spoon to combine. Tip the mixture onto a well floured work surface and flatten it out to allow it to cool a little faster. 2. Start to make the filling. Meanwhile, place the butter and vegetable oil into a frying pan. Set over a medium heat on the hob. Add the onion and gently cook for about 3 minutes until it starts to soften. Add the garlic and chopped tomatoes. Continue cooking for a minute or two longer. Add the carrots and chopped hearts of palm. Allow the vegetables to cook, stirring periodically with a wooden spoon.3. Continue with the filling. Place the corn flour into a jug. Add 2 tbsp of the measured milk and stir until smooth. Pour the milk and blended cornflour into the vegetable mixture and stir to combine. Add the cream cheese and a pinch of salt to season. Stir again to allow the cream cheese to melt and blend with the filling. Cook over a medium heat for 5 minutes, stirring periodically. 4. Allow to cool. Turn off the heat under the vegetable filling and allow to cool.5. Knead the dough. Once the dough has cooled knead it for 2 or 3 minutes until it is smooth. 6. Preheat the oven, to 200c / 180 Fan / Gas 6.
a) Aim not to roll the dough too thinly. b) Try not to stretch the pastry when encasing the filling. c) The pasties can be made smaller providing a greater yield which would be great for a buffet. Meat Free Mondays hosted by Jacqueline over at Tinned Tomatoes. I've never cooked or even eaten hearts of palm before so gold star to you and what a way to cook them. Pastry is always a winner in my book. Thanks for entering it into Meat Free Mondays. 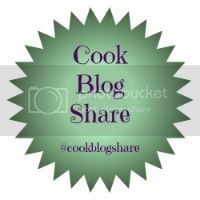 I featured your recipe and stumbled, pinned & tweeted. Hahaha, I'm glad it's not just me who chooses her dessert before the main meal, it's definitely the way to go 🙂 Thank you for your lovely comments Sarah, hearts of palm were a new flavour for me too but we thoroughly enjoyed them – especially in the cream cheese filling alongside the other veggies. I'll certainly use them again, but more as a special treat rather than an everyday thing. Thank you Eb 🙂 Both Mr E & I really enjoyed them when they were cooked with the cream cheese mixture, absolutely scrummy 🙂 You're welcome Eb, I knew absolutely nothing about them until the other day – they're certainly not like the vegetables we classically think of. Oh liking this and so fantastic that you managed a Rio theme dish, I haven't got round to making anything Brazilian during the Olympics, though I have been following it. It was really interesting learning a little about traditional Brazilian foods Shaheen and even more fun eating it 🙂 The games have been amazing haven't they – really impressed by what has been achieved. I've seen them quite a few times whilst in the supermarket and have often wondered what they actually are (though the name of them now make perfect sense – apart from the burgular's thigh name!) so when I came across several traditional Brazilian recipes which use them i knew it was the perfect opportunity to check them out properly. They're absolutely delicious Hannah, although I admit it might take a couple of bites to get used to the flavour if you try them straight from the tin. Ooh heck yes, I can't wait for GBBO to start. Will you be trying out some of the bakes?